We offer mountain bike guiding for riders of all levels of experience across the bridleways of the Peak District led by MIAS Level Two qualified instructors with over 15 years mountain biking experience across Europe. 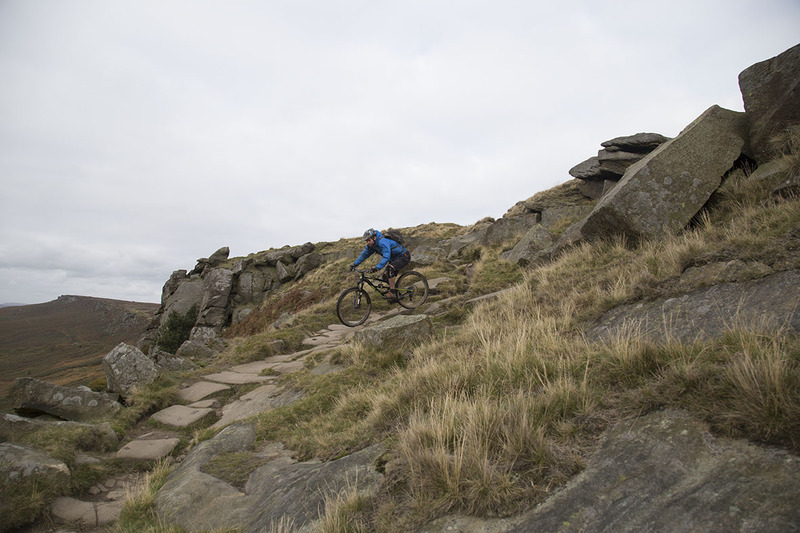 Peak District Mountain Biking can offer one day’s mountain bike ride, a full weekend, or even a whole week’s holiday of riding from the door of your accommodation. We pride ourselves on offering a bespoke service so once you get in touch we’ll ask you what type of riding your enjoy in terms of the style of trails, the difficulty and your fitness. We’ll then factor in current trail conditions and the expected weather and plan some fantastic Peak District mountain biking routes to suit you and your group. We recce all our routes to make sure they’ll be no issues on the day, all you’ll need to do is soak up the views, enjoy the fun, and pedal up the hills (we can’t do that for you!). Because we’re local guides we know the most picturesque photo opportunities, the most interesting points of local historical interest, the best sheltered spots for a quick rest, and the cosiest cafes. We are also trained in first aid in the outdoors should there be any mishaps. If you’d like a few tips on how to improve your riding whether it be climbing, cornering, jumping or descending the steep stuff we are happy to help. We can recommend B&Bs, hotels, cottages and bunkhouses and even give you a heads up on where to get the best pub grub and real ale in the area. Bike hire can be arranged too. www.mtbandb.co.uk offer super-flexible and hassle-free mountain bike hire delivery service providing high spec bikes including full-suspension, e-bikes and hardtails across the Peak District. One day of guiding is available from £20 per person depending on the dates and group size. Email jon@extratimecoaching.co.uk or call 07789 114779 to check availability or ask any questions and you can be enjoying mountain biking in the Peak District very soon.